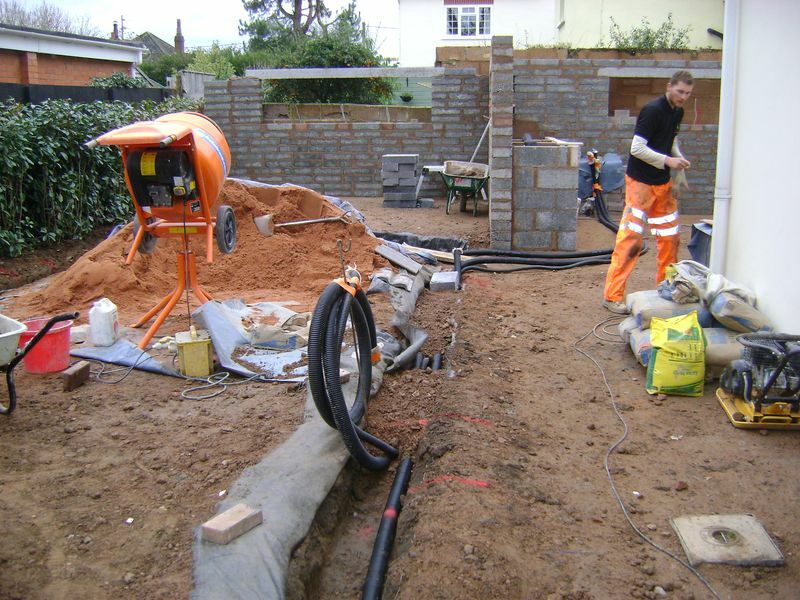 The trench depth for the 60mm diameter black ribbed duct is hand dug at 300mm, I still have an additional 100mm of consolidated sub base to install bringing the overall depth to the required 400mm. This particular ducting product comes with a draw cord inserted within the duct, as a rule of thumb I would tie two pieces of timber at each end of the ducting so not to loose the cord, then cover with plastic to stop debris falling in the duct, then the appropriate colour code tape is wrapped around the end of the ducting. However, on this occasion I insert all the electric cable for the project with a meter spare at each end. The pre installed draw cord is left in the duct in-case additional cables or a later replacement may be required. 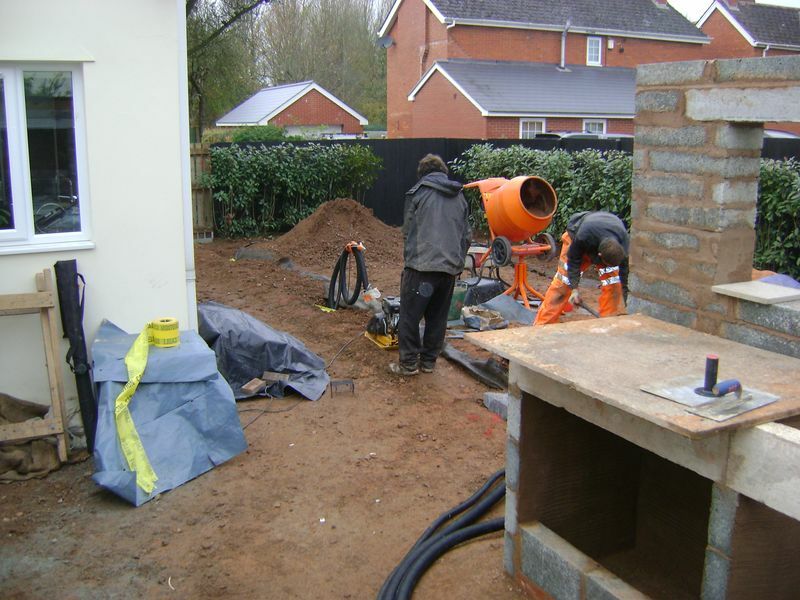 The ducting is backfilled with the 40mm to dust to a level of 150mm from finish floor level, FFL, and consolidated. 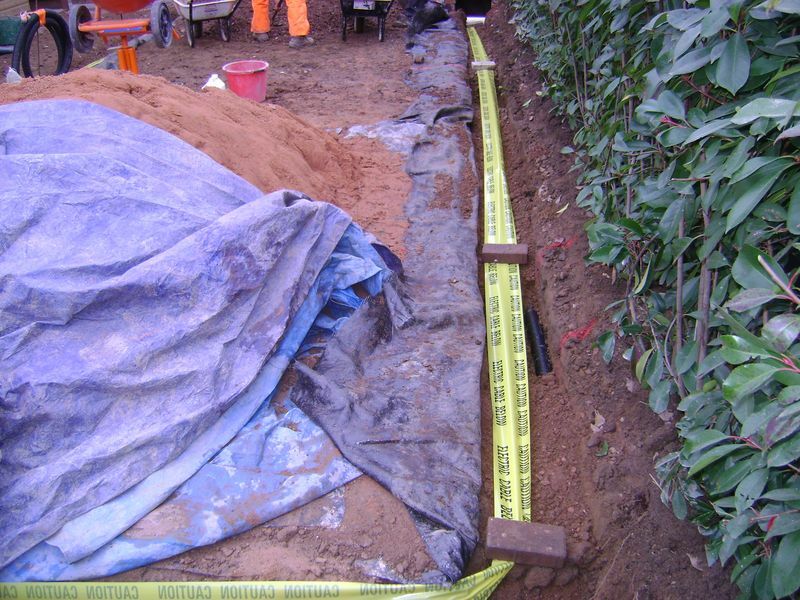 The trench is semi backfilled to the required level of 150mm below FFL and the ducting is marked with electrical warning tape. 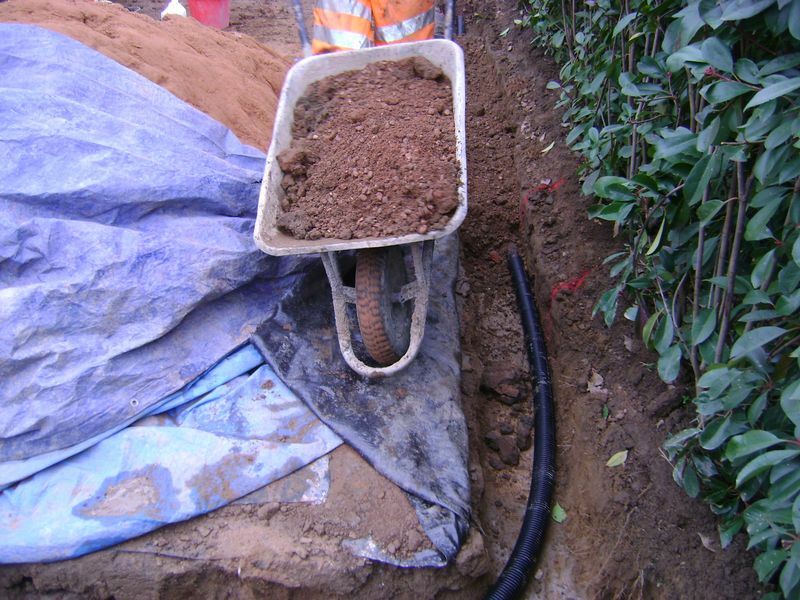 Once the entire ducting has been taped the trench is filled and consolidated in 100mm layers, compacted until the required height of fill is reached. No my team member isn’t about to run the wacker plate over the mixer cable, the mixer is unplugged before three passes on each layer is consolidated, all our trenches or any back fill is built up in 75-100mm layers and compacted, the seven perimeter raised black limestone planters with up lighters have been left open for the later looping of the electrical cable. 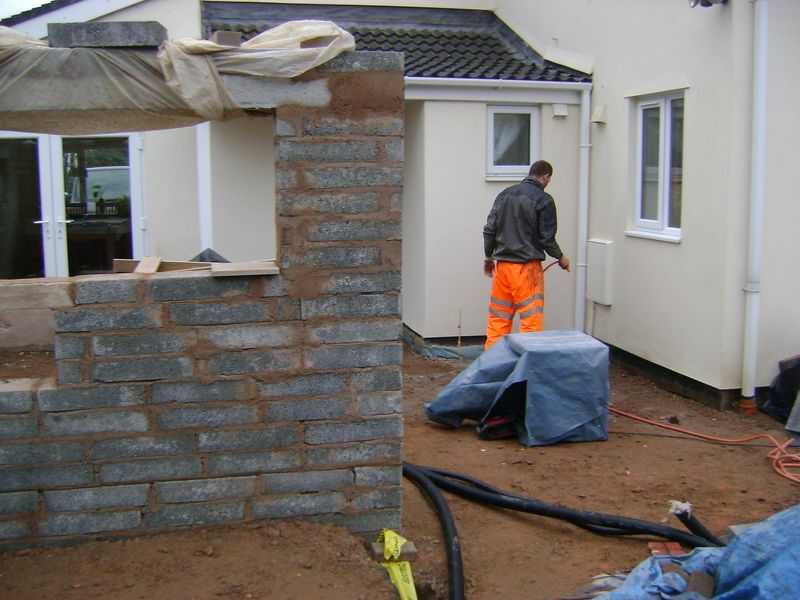 The brick work is installed to the rear of the two recess walls, six courses are required for each wall. 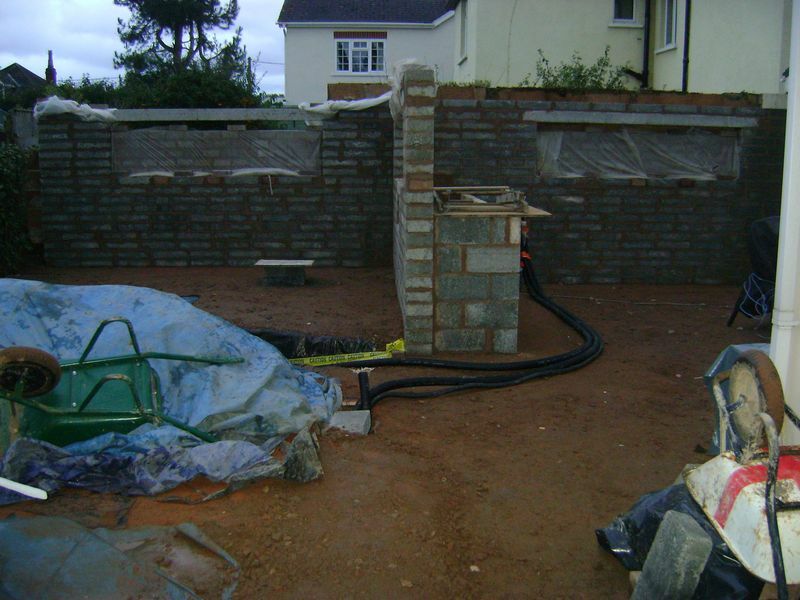 I run five courses at present and will finish the last course of brickwork once the mortar has gone off, making the final course so much easier to lay. I rarely see any of my clients past or present whilst I’m building their dream garden, so I try to put myself in their position. Each Friday evening the team will carry out what’s known as our “Friday clean down”, I know that all my clients will walk onto the project together over the weekend and view what’s been created throughout the week and visualise together the finished landscaped garden, so the site is left as tidy and safe as possible, windows, sills are washed of dust and all components to the garden build up are stowed away. 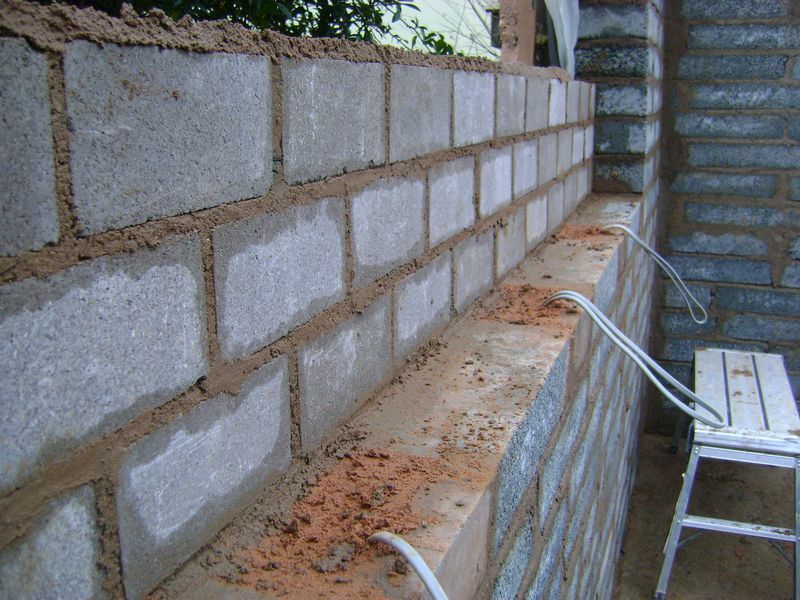 I’m unable to complete the walling as I await my final lintel, I’m assured this will be with me by Monday, shame really as I would have liked the walling to be going off over the weekend. PreviousPrevious post:Garden water reflection pond preparationNextNext post:Garden construction and landscape build.